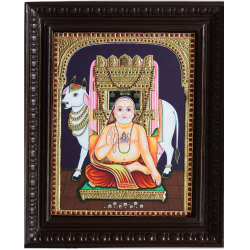 "The uniqueness of Tanjore paintings compared to other art forms of India is that they are embossed with real gold, almost like a carved mural in an old temple. 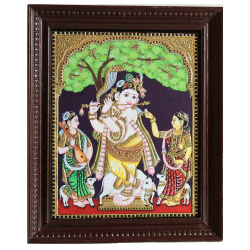 The elegant paintings depict famous spiritual scenes such as baby Krishna playfully eating butter or Lord Rama's grand wedding celebrations. 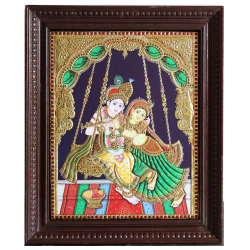 These paintings are generously adorned with semi-precious stones that add more beauty to the stunning gold finery." 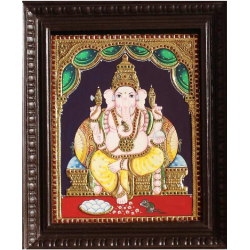 Fittingly, our Tanjore paintings are delicately handcrafted with inctricate details and framed in carved teak-wood Chettinad frames in classic styles." 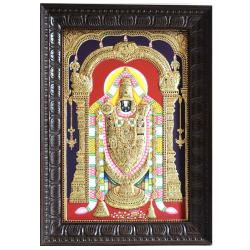 Timeless Tanjore is a journey of discovery - acceleration of artistry, originality, and the incredible harmony of the different cultural treasures all around us. 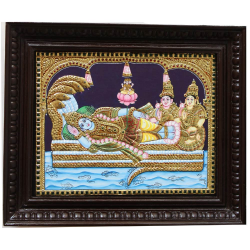 Our traditional handcrafted Tanjore paintings are whole stories in one frame; they're a warm reminder of the divinity that is all around us, now brought closer for you to take home. 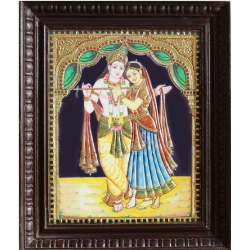 We're fascinated by nuances that the unique touch of an artisan's hand brings to a painting, the details that transform a "perfect" piece into a collectible. Let's share with you a piece of ancient India's golden history.